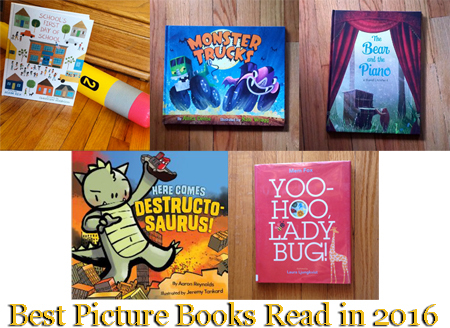 I was going to splurge and share TEN of our favorite picture books read in 2016 because, let’s be honest, that’s most of what’s read around here, and there are SO MANY GOOD ONES that picking five is impossible. But I had the list and then decided to just share the five most recent in detail, and list the other five favorites. School’s First Day of School by Adam Rex (2016). Frederick Douglass Elementary is a brand new school, built from the ground up, and he gets used to just having the janitor around keeping him clean. The janitor tells the school that soon he'll be full of children, and school gets very nervous. The school has to learn everyone's names, and how to act, and how to make friends... Can he do it, or will he be too scared?! Reviewed in detail here. Monster Trucks by Annika Denise (2016). My son loves monster trucks, but this book is extra fun because the trucks are actual monsters! The monster trucks race each other on a spooky night, but what happens when a new vehicle shows up on the track? This one is included in my Halloween Book Recommendation video. The Bear and the Piano by David Litchfield (2016). This book is so sweet and touching! I'll admit, I teared up at the end. The story is great, and the artwork is beautiful. Definitely one I'll keep coming back to, whether I'm reading it aloud to my son, or just reading it to myself! Here Comes Destructosaurus by Aaron Reynolds and Jeremy Tankard (2014). The whole family loved this cute, witty book. Destructosaurus is trashing the whole town, burping fire everywhere, and not listening to the reader, who is trying to keep him in line. When the reader finds out Destructosaurus was just throwing a tantrum because he couldn't find his teddy, the tone changes...but so does the terrifying main character! Yoo-hoo, Lady Bug! by Mem Fox (2013). This book is SO cute, I can't stand it. It's kind of like Where's Waldo? for kids, but on a simpler scale. There are illustrations of a crowded shelf, or a staircase with toys strewn about, and the reader has to find the ladybug in each. There is a simple rhyme to say before finding the ladybug, and a "solution" with the ladybug zoomed in on the next page. My son and I both enjoyed this book immensely. Boy + Bot by Ame Dyckman and Dan Yaccarino (2012) was previously reviewed in a What We Read This Week post. Nothing Like a Puffin by Sue Soltis (2011) is a fun book comparing and contrasting a puffin against other animals and objects. It's a great book to read aloud with your kid and let them point out and name all the things they identify and, depending on age, guess at what qualities are similar to or different from the puffin. A Balloon for Isabel by Deborah Underwood and Laura Rankin (2010) was previously reviewed in a What We Read This Week post. Bee-Wigged by Cece Bell (2008) and Unlovable by Dan Yaccarino (2002) are both reviewed in previous What We Read This Week posts.